Familiar to anyone who’s used Steam is the feeling of perplexity when you are sure a game was closed only for Steam to cough up the disconcerting ‘’Failed to start the game (app already running)’’. 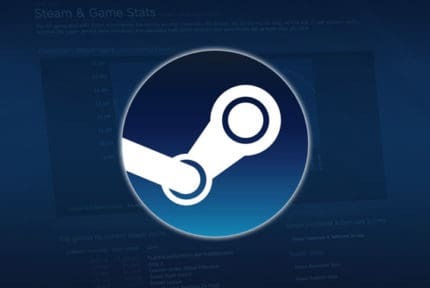 Although not completely shutting down the game is the prime reason for the issue, Steam has been known to produce it due to factors unbeknownst to even the most versed Steam user. 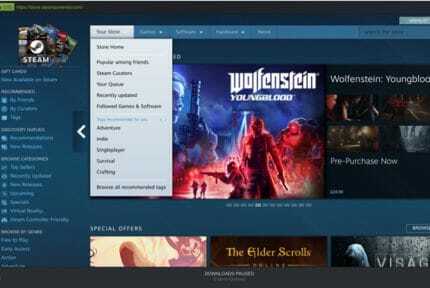 Here’s what to do if Steam says a game is running. Our fixes are compiled in steps meaning we recommend starting with the first and working downwards until the problem is resolved. The last solution is rather tedious and as such should be used as a last resort. Hit Ctrl+Alt+Del on the keyboard and click on ‘’Task Manager’’ from the list options that appear at the forefront of a blue background. In Task Manager, navigate down the list of services until you spot Steam. Click on it, then hit ‘’End Task’’ just below. For good measure, allow a minute for the client processes to shutdown then relaunch Steam. If a restart doesn’t work, this means the game might be running in the background even though it is ostensibly closed in the Steam client. 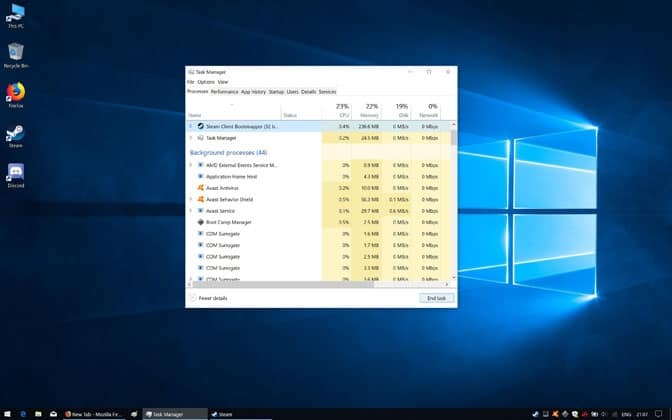 Open up Task Manager as detailed above. Click on the service, then on ‘’End Task’’ once again. Restart Steam as above to be on the safe side. Some titles have a launcher that co-exists alongside the Steam client. If a game produces an intro menu that is effectively outside of the game, this is more than likely a launcher, and it will often minimize as an application in the system tray. Check your system tray and if you spot a launcher, right-click on it and hit close, quit, exit or any variant thereof. 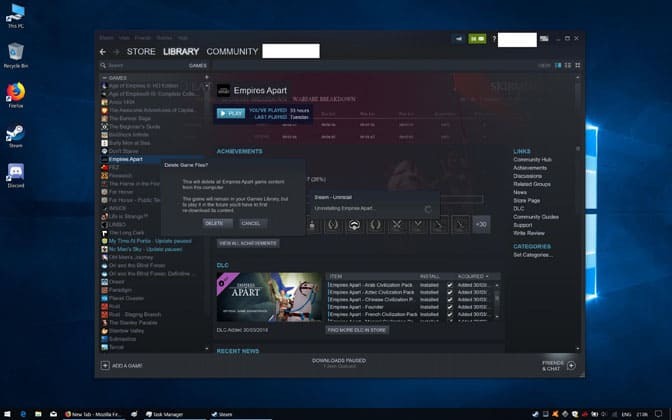 Restart Steam as above and launch the game as usual. If you’ve had no luck with the three methods above, a full system restart is the next likely contender to resolve the problem. Not only does it reboot Steam and any associated temporary files/data, but a Windows reset doesn’t go amiss. Should a restart not fix the problem, move on to reinstalling the game. Note that this method requires downloading all the game files again and, therefore, does come with a time constraint. Click on ‘’Library’’ and right-click on the game. Among the list that pops up, select ‘’Uninstall’’. When prompted by the ‘’Delete Game Files?’’ warning, click ‘’Delete’’. Steam will remove all associated game files. Restart Steam as detailed further up. Locate the game in your Library and click on ‘’Install’’. Click ‘’Next’’ in the install window, then ‘’Finish’’. Allow Steam to download the game files in full. By this point, chances are the problem has been resolved. In the unlikely scenario that this isn’t the case, we come to our most drastic fix – reinstall Steam. Right-click on the Windows Start menu and click ‘’Search’’. Type ‘’Control Panel’’ into the search field and select the first result. 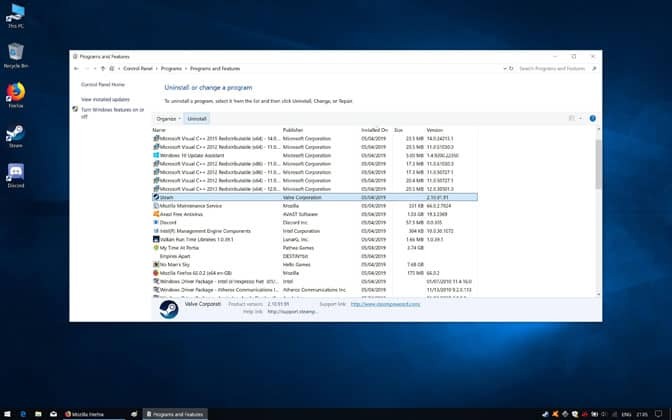 Click on ”Uninstall a program” under the ”Programs” icon. 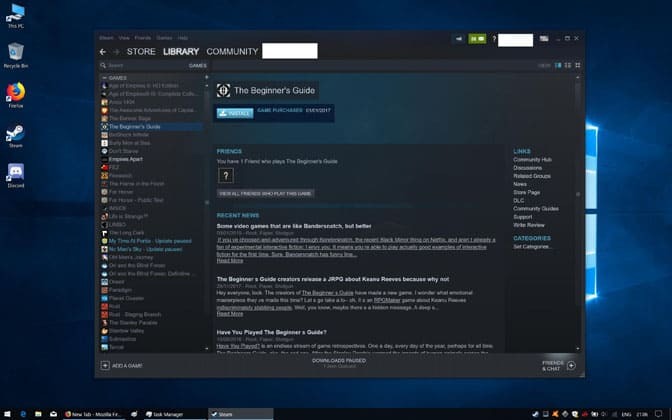 Find and click on Steam in the list of programs. Hit ”Uninstall” just above the list. When finished, download the latest version of Steam here. When downloaded, double click on the executable file and complete the installation wizard steps. Install the game as above.